2016 Vladimir Guerrero Jr. Rookie Card Bowman Chrome Prospect Sweepstakes PSA 10 GEM MINT! 2016 Bowman Chrome Vladimir Guerrero Jr. (future HOF?) HOT CARD! Seriously, this card is THE card when it comes to Vladimir Guerrero Jr. rookie cards! Load up on these bad boys. Comes 20 years from now this card will be well into the 4 digits (5 when considering the autograph versions). GoldCardAuctions.com will be giving the 2016 Bowman Chrome card Vladimir Guerrero Jr. rookie card periodically until further notice. Our first winner was Brandon O. from St. Louis, MO. Our next drawing will take place on or around 6/9/2019. Learn how to enter below. Enter to win a 2016 Bowman Chrome Prospect Vladimir Guerrero Jr. ROOKIE RC PSA 10 GEM! How to enter: In order to enter the Vladimir Guerrero Jr. Rookie Card Sweepstakes, you must follow GoldCardAuctions or write a review about GCA on Facebook. That’s it! The Vladimir Guerrero Jr. 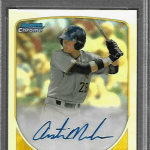 Rookie Card Bowman Chrome Sweepstakes will run from 4/9/2019 to 6/9/2019. A purchase is not required but you MUST FOLLOW GoldCardAuctions on Facebook (if you have already followed us please leave a review in order to enter). 2016 Bowman Chrome Vladimir Guerrero Jr. is part of the 2016 Bowman Chrome set. 1. TO ENTER: Must follow or review GoldCardAuctions on Facebook. Only one entry is allowed per person and a purchase is NOT required in order to enter. 3. ELIGIBILITY: Must be 18 years of age or older and a legal resident of the United States. 4. Vladimir Guerrero Jr. Rookie Card Bowman Chrome Sweepstakes DRAWING: On 6/10/2019 sweepstakes administrator will randomly select the potential Grand Prize winner from all eligible entries received during the applicable contest period. 5. PRIZES: One (1) Grand Prize: 2016 Bowman Chrome Prospect Vladimir Guerrero Jr. ROOKIE RC PSA 10 GEM! The grand prize winner will have 24 hours to respond to a message via Facebook or a new winner will be selected. One prize is allowed per person. This sweepstakes is in no way sponsored, endorsed, or administered, or associated with Facebook or Major League Baseball. 8. WINNERS LIST: The name of the winner (first name, last initial will be posted the Gold Card Auctions Facebook page on or around 6/10/2019. 9. The Grand Prize Winner agrees to have some of their information (first name, last initial of their last name, city, and state of residence) posted on Facebook. This is a SUPER NICE CARD! Visit our eBay store at www.ebay.com/str/goldcardauctions. 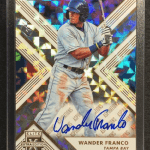 Filed Under: Bowman Chrome, Gold Card Auctions Sweepstakes, Rookie Cards, Vladimir Guerrero Jr. I must win this … It’s in the card. Gonna be better than his pops! bold statement Conrad but we agree! I used to have this card but never graded I want it. Thank you for the chance to win this wonderful card!!! Best prospect in baseball. Stay healthy young man. A star is born! Looks like I got lucky! T206 Ty Cobb GREEN PORTRAIT PSA EX 5 – Could This Card Fetch $15,000?